Aspire! 's flagship Learning ROCKS! 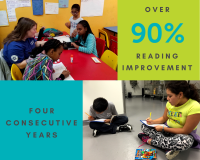 Program supports upper-elementary students' general academic achievement and social-emotional development, placing a heavy emphasis on helping students to develop both their reading skills and a love of reading. Toward that end, Aspire! 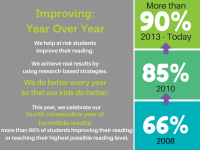 commits to achieving the same outstanding results that have been benchmarked in the past four years, with at least 90% of students improving their reading instructional levels. More critically, 82% of English Language Learners made significant gains in their English proficiency this year. Science, technology, engineering, art and mathematics are critical tools for all young leaders. Aspire! 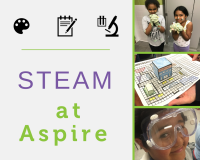 focuses on STEAM skills throughout the year to reinforce the knowledge gained in school. Throughout the year we work on math facts sheets, play math hopscotch and use project-based learning to bring science into our classrooms. Each year we end our program with a Science Fair, providing early exposure to the scientific method and preparing them for middle school and high school projects. We have had Science Fairs to promote STEAM for over 10 years! 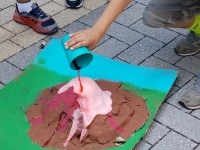 To prevent summer learning loss, we dedicated a week of summer to scientific principals and experiments. We know this type of engagement with science, math and the arts can open up young minds to a world of possibilities.